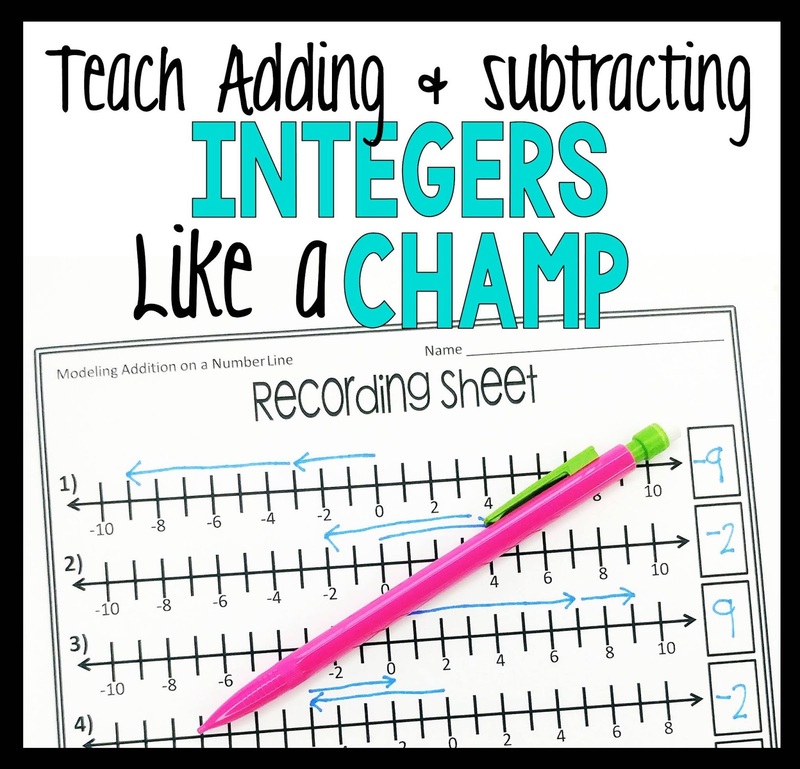 Adding and subtracting integers can be a tough concept for middle school math students to comprehend. Especially if students have been taught that subtract always means to get smaller. 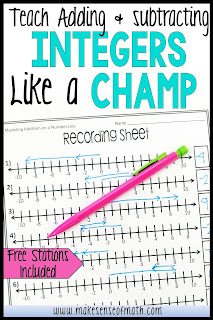 I wanted to share some tried and true successful ways to teach students how to successfully add and subtract integers. 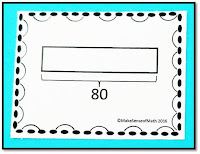 1) Use number lines: Number lines are essential when introducing adding and subtracting with integers. I always found it easier to give students a paper with a bunch of number lines on them to speed up the process of teaching. Having students draw number lines for each problem can take a lot of time. 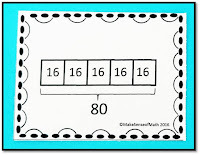 Another thing that I have done was to give students one number line in a protective sheet. Then they use a draw erase marker to draw on the number line for each problem. They can just erase the arrows after each problem. Also, students love dry erase markers...so they always creates extra engagement. 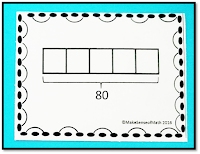 2) Teach subtraction as adding the opposite, then have students rewrite subtraction problems into addition problems. For example, 5 - (-3) changes to 5 + 3, because you add the opposite of the second number. Another example, -4 - 6 changes to -4 + (-6). 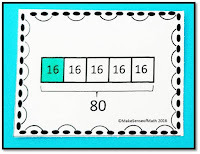 Having students circle the second number also helps those struggling with distinguishing between the subtraction sign and the negative sign. You might need to remind students that when there is no written sign such as in -4 - 6, then 6 is positive, but then you will flip it to a negative. 3) Lots of practice with basic numbers: Don't jump to adding and subtracting large value integers until they have a really good conceptual understanding. Do lots and lots of number lines and rewriting subtraction into addition. 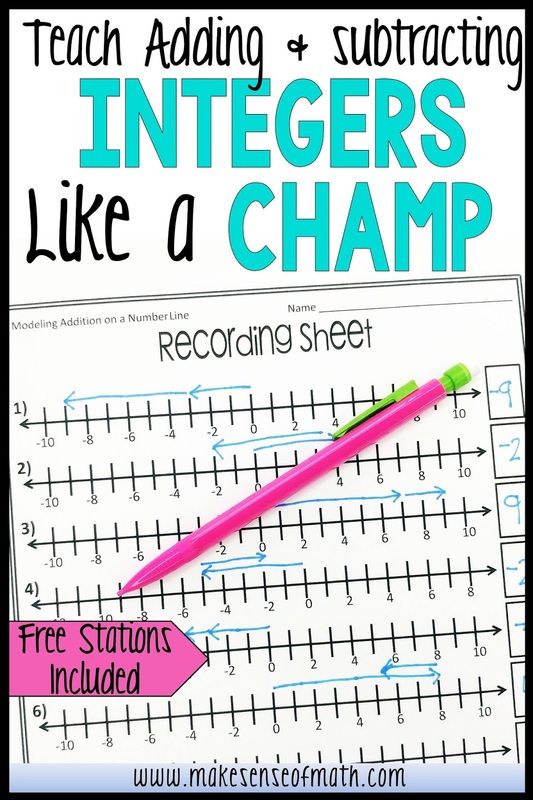 I created some FREE ADDING AND SUBTRACTING INTEGERS STATIONS for you! Click here to get yours now! GRAB YOUR OTHER FREEBIES HERE! I know I'm not the only one who wishes all school was cancelled on Halloween and the day after Halloween. So much excitement in the air and so much sugar in their bodies, makes it hard to teach. 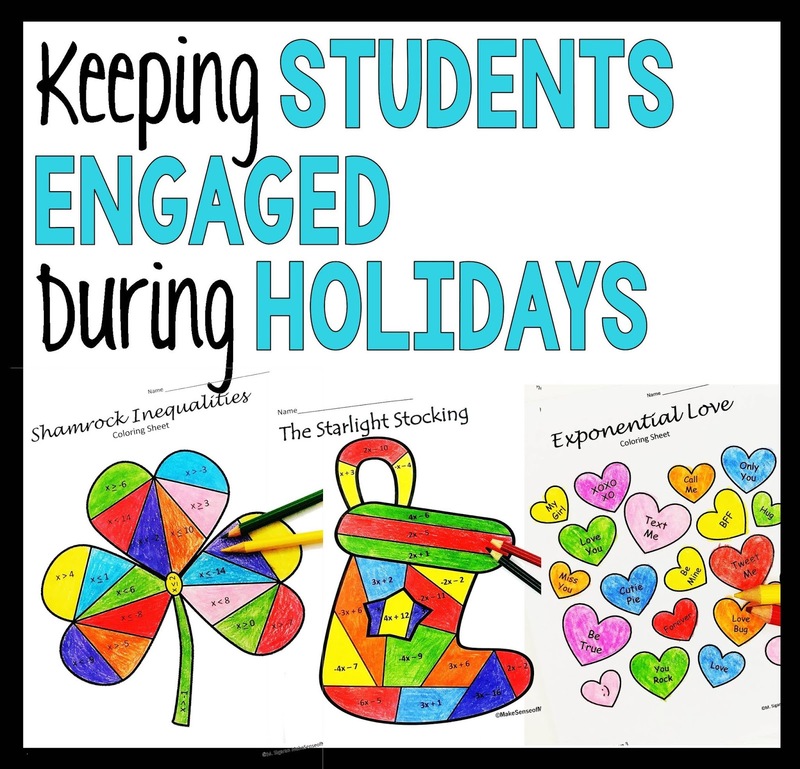 I want to share some tips that have worked for me to effectively teach during the holidays. Keeping your routine is the most effective strategy to having a successful day during an exciting time of year. Start class the same way you always start class. Transition from activities the same way you always transition. End class the same way you always end class. Keep your routine, and the students will be more likely to keep their routine. Acknowledge the excitement of your students, but let them know that you expect the same behavior as any other day. Don't budge on classroom management. I love the idea of "work hard then play hard." I would often take the time to teach this to my students, and reinforce this concept on days when they especially needed it. Even middle school students love to do fun holiday activities. I think it's ok to do holiday activities, but it is important to keep them standards based. 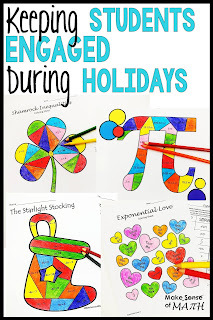 You definitely don't want to waste a day of teaching, but you can be creative and teach the standards while recognizing the holiday. 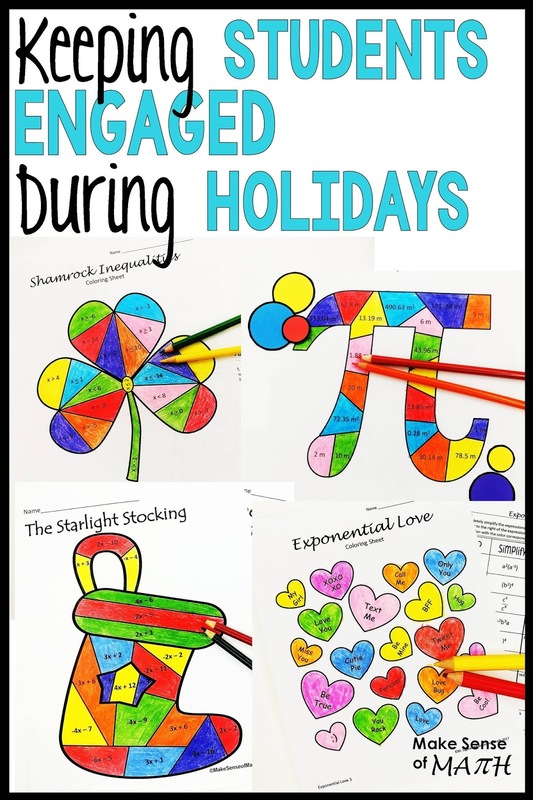 If you need some HOLIDAY MATH ACTIVITIES YOU CAN CHECK THESE OUT. I was at the beginning of my teaching career when the "turmoil" over the common core standards was in full force. My state had changed their standards to the "Utah Core Standards," but they were really the common core standards in disguise. They were trying to avoid the terminology "common core" and all the political problems it was causing, but the truth was that the state recognized that these were quality standards, and it would benefit the students in my state if they were implemented. Before the 1960's arithmetic was the majority of what was taught in math class. Then the United States entered the space war with Russia...the USA was determined to become the best. As a result, the "new math" was introduced. The "new math" dove into matrices, trigonometry, geometry, and more all on a very conceptual level. 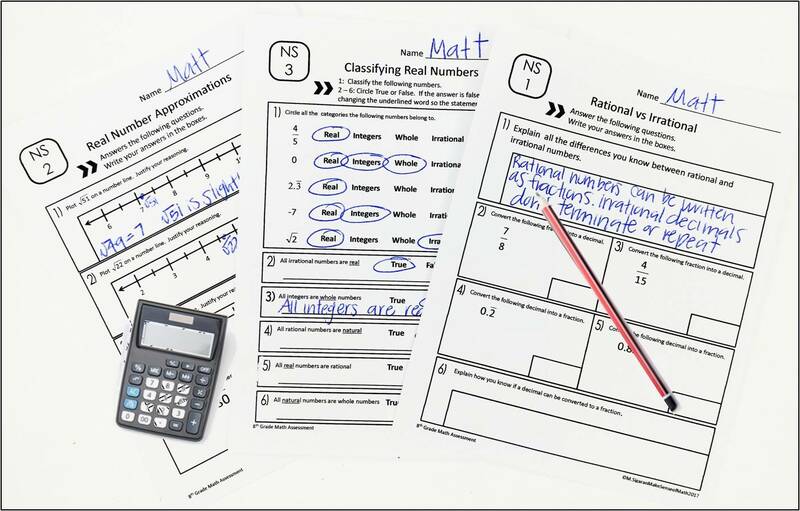 The "new math" eventually received a lot of push back as many people thought it would be more beneficial for students to learn a little about a lot of math. The curriculum then changed to "a mile wide but an inch deep." At this point, math became less conceptual and more algorithm based. The students that naturally had good math reasoning were still pushed along and entered Calculus during high school, but every one else started to get left behind. This became evident when they entered college. The basic level math classes at the the Universities were full and many students were struggling. It was clear that the standards were failing many students. Purely conceptual wasn't a solution, and purely procedural didn't work either. The new standards were created with the goal of valuing conceptual and procedural. With these new standards, the hope of many educators is to not lot students get left behind. To allow all students to succeed. First, teach at a conceptual level so students can reason through the mathematics and perhaps even discover an algorithm. 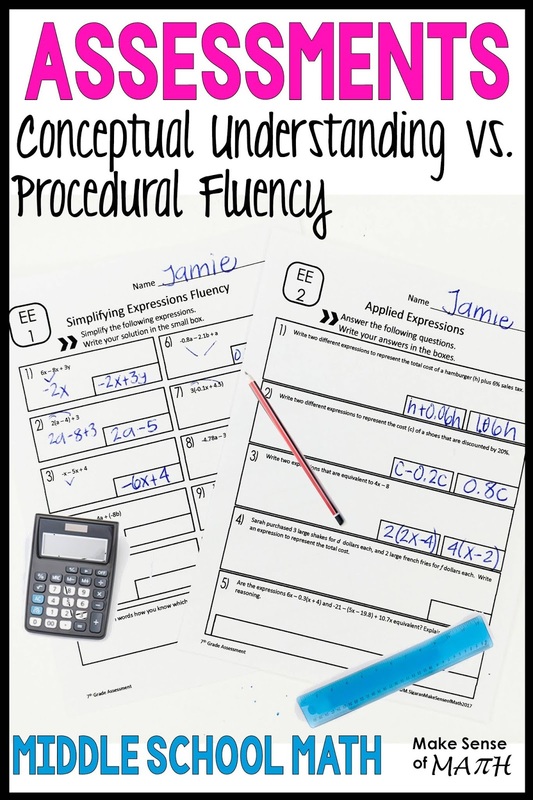 Encourage procedural fluency, but only after they have mastered conceptual understanding. With these ideas in mind is how I create all of my resources. 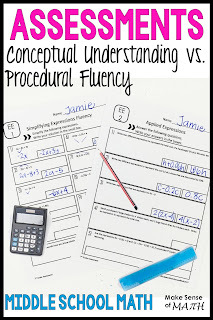 Valuing both conceptual understanding and procedural fluency. 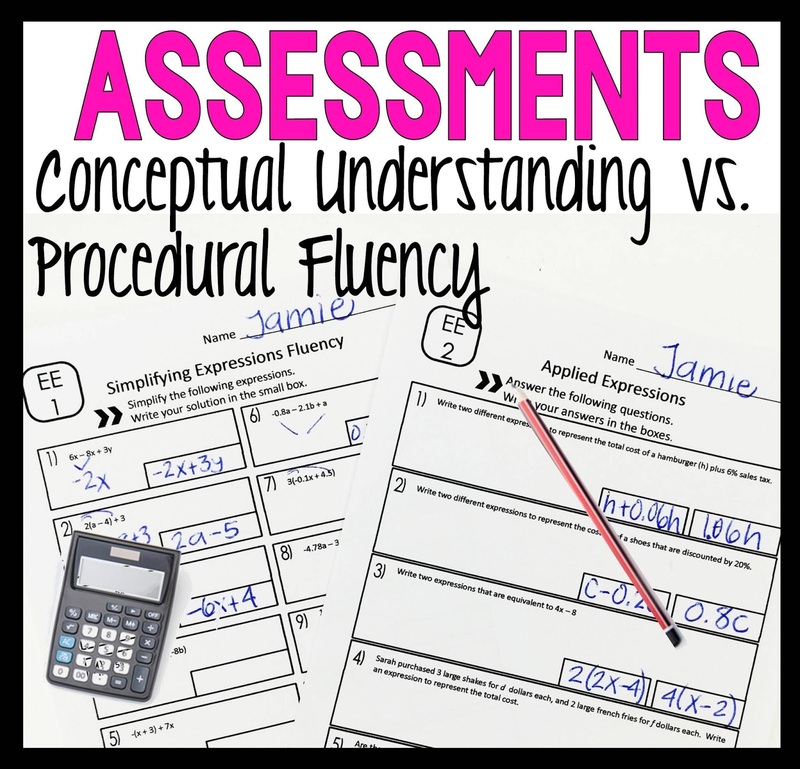 If you are interested in some math assessments that assess both conceptual understanding and procedural fluency you can click on the links below. They are also editable for use year after year. 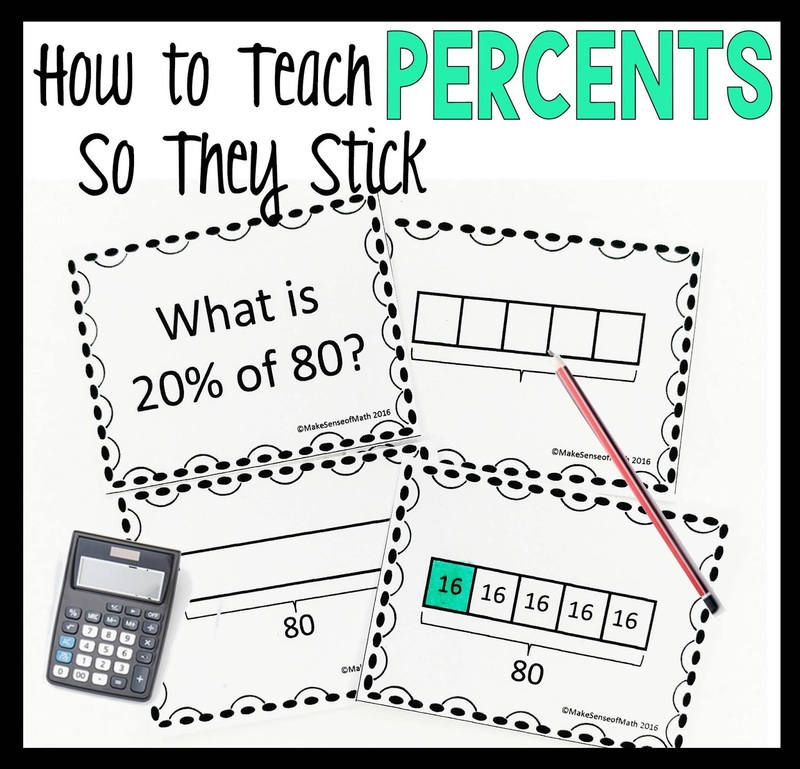 Using bar models to teach percents of whole or to calculate the whole given the percent and part is a very effective way to teach percents conceptually. When introducing this way, I highly suggest starting off with percents that are divisible by 5. You can eventually do any percent with combinations of 5% and 1% as a tenth of 10%, but start off simple. Let's look at percents of a whole. An entire bar will represent the whole. Draw the bar and label the whole. 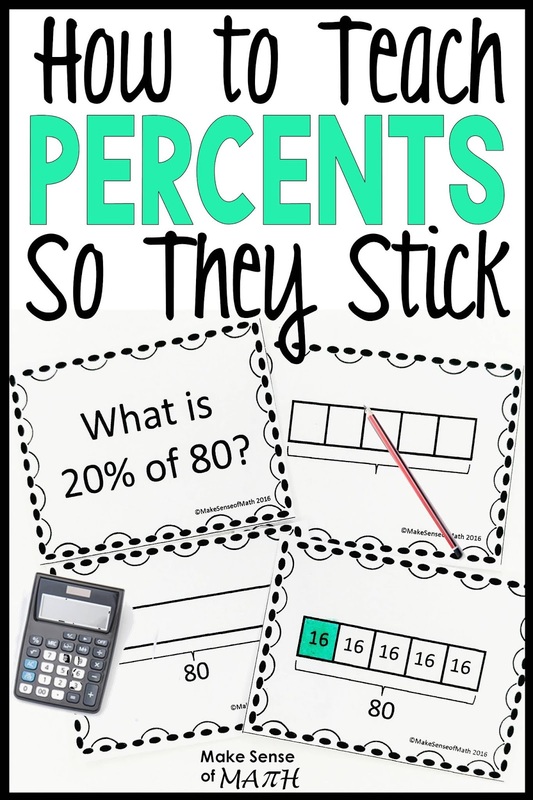 Then you need to divide up the bar based on the given percentage. 50% would be in half. 20% would be divided into fifths. 30% would be divided into tenths. Use guiding questions to help your students think of how to divide the bar. If they are stuck, always dividing it up into tenths or fifths should work, as long as you are using percentages that are divisible by 5. Next you need to divide the whole up into that many sections. Again, use guided questions to help your students figure out how to do this. They should come to the conclusion that the whole divided by the number of parts is the amount per section. Write that amount in each of the sections. Lastly, determine how many sections you need for the given percentage. 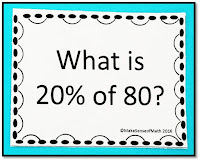 The students should already know what percent is each section from the first step. After the number of sections is determined, I like to color the sections in on my bar so students can visually see the percentage of the whole. They can then determine the part by looking at the value of the total colored sections. Bar models can also be used with finding the whole given a part and a percent as well as finding the percent given the part and whole. Let me just put this disclaimer on this method: Doing percents with bar models may take a lot of work at first. Each problem will take longer than if you just gave your students an algorithm. This is how it is with most conceptual teaching. However, I know that as you teach conceptual at first, and take the time to have the math make sense to the students, they will retain the information, and in turn, you won't have to do all of the extra review at the end. Hi, my name is Michelle, and I love mathematics. I hope that my enthusiasm for the subject shows in my writing and through my products. I received a B.S. in Mathematics from the University of Utah. I then continued my education to become a certified teacher. 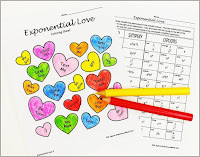 I also have taken various masters classes about math pedagogy including topics such as developing a growth mindset in the math classroom, the common core and connecting topics throughout the grade levels, team-teaching with a special-education teacher, and modeling with mathematics. I taught middle school mathematics for six years. In addition to my regular classes, I also taught remediation math and honors math. 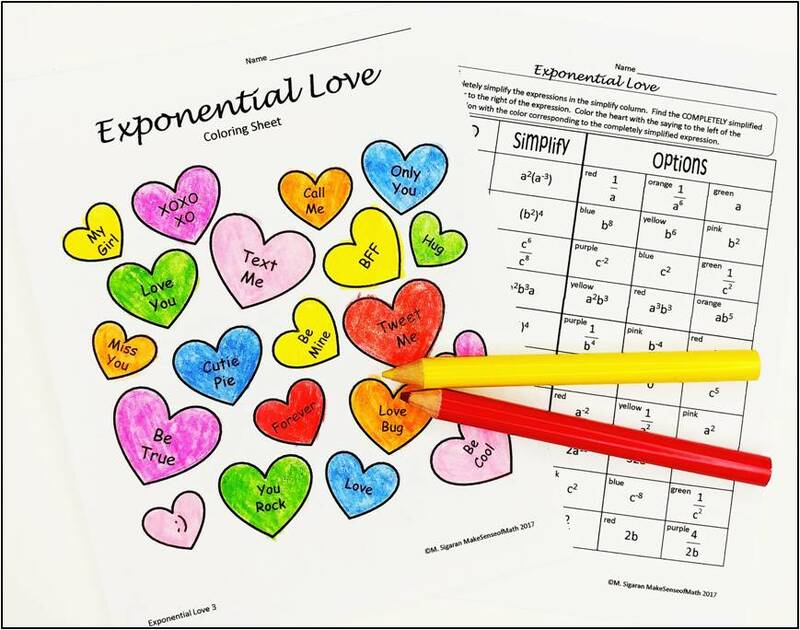 I set up my classroom curriculum for students to use higher-order thinking skills on a daily basis I currently am a math curriculum designer, creating materials to help students make sense of math. © 2015 Make Sense of Math. Natasha Template designed by Georgia Lou Studios All rights reserved.